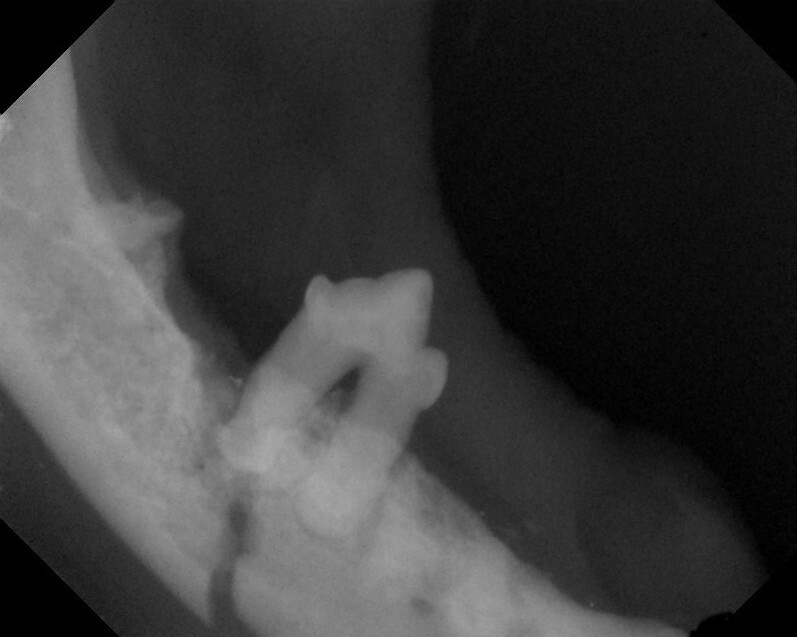 Dental radiographs (x-rays) are one of the most important diagnostic tools available to a veterinary dentist. They allow detailed examination of the internal anatomy of the teeth, tooth roots, and the bone that surrounds the roots. Dental x-rays help diagnose many conditions that may otherwise go undiagnosed. For example, dental x-rays can help the doctor discover fractured or broken roots, cysts, tooth resorption, early tumors, or unerupted teeth. They also help clinicians examine teeth that appear healthy but may be compromised on the inside. Periodontal disease can be staged and addressed by examining the dental x-rays for bone loss around tooth roots. The radiation risk to the patient from taking dental radiographs is minimal. Apex uses digital radiography, which requires less exposure when compared to standard film x-rays. Compared to the traditional skull x-rays, intraoral x-rays provide superior quality for examination of individual teeth or sections of the jaws. 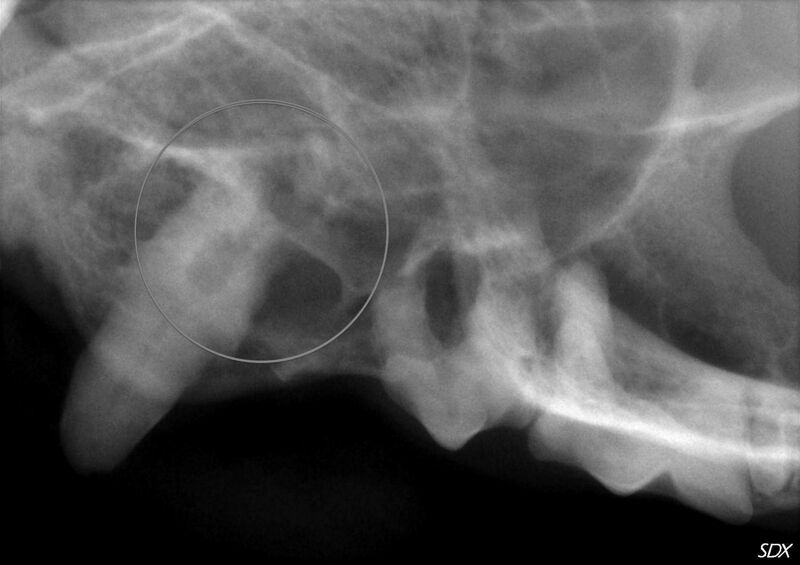 Because veterinary patients will not cooperate when a digital sensor is placed in the mouth, taking dental x-rays requires that the patient is anesthetized or sedated. 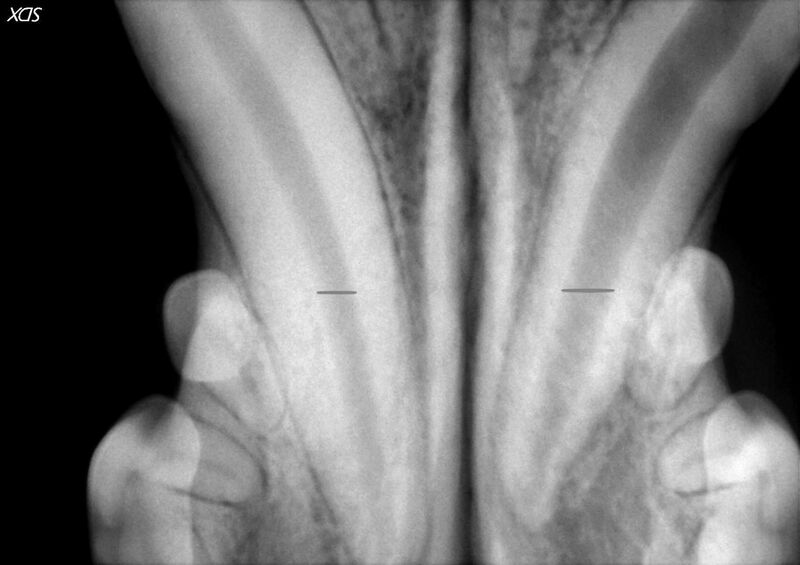 A dog's lower canine teeth are imaged in this dental x-ray. They both appeared normal on examination. On x-rays inner pulp canal of the tooth is seen as the dark central part running along the tooth. When comparing the two large canine teeth, the widths of the pulp canals should be the same. However, the widths of the teeth, highlighted by the lines on the radiographs, are quite different. The canine tooth on the right has a much wider canal which indicates tooth death in this case. This tooth should be treated with root canal therapy or extraction. 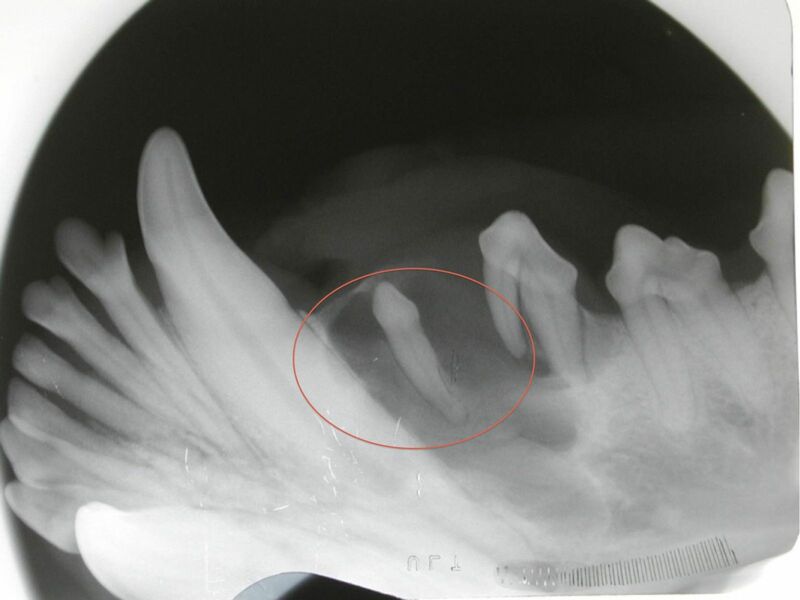 This large canine tooth on a cat appeared normal on visual examination. Dental x-rays of the tooth showed that the root had tooth resorption. The area where the root should have been is circled. A swelling of the lower jaw was noted on a dog. On examination, no visible tooth in the area was noted. 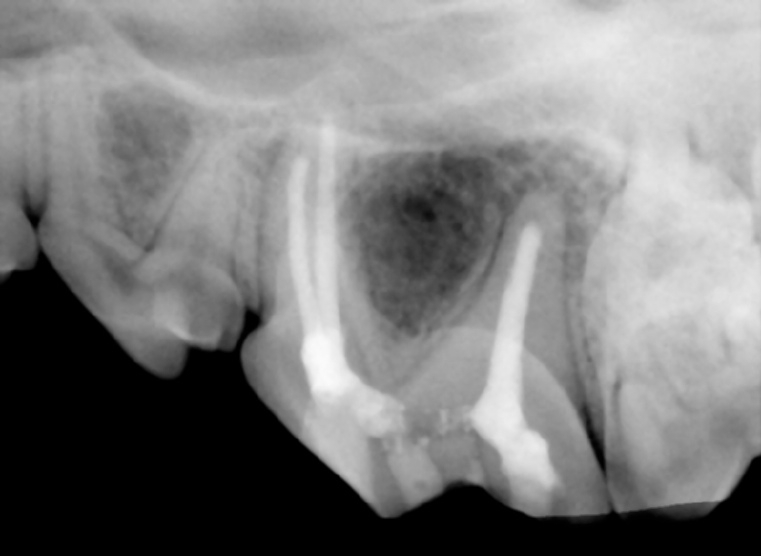 However, dental x-rays show a tooth below the gumline that was unerupted and had caused a cyst to form. This tooth was fractured at the outside crown of the tooth (see arrow). 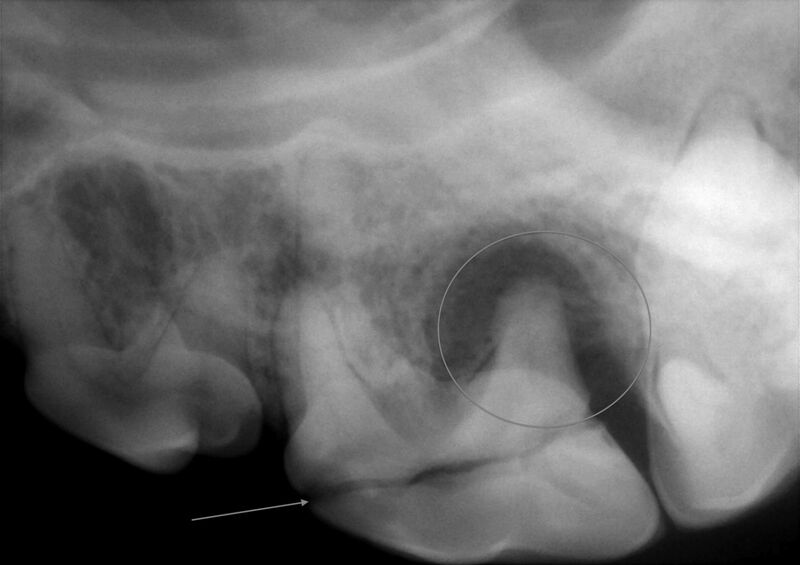 Dental x-rays of the tooth showed significant infection (dark area circled) at the root of the tooth. Having this information helped plan the proper extraction technique of this badly damaged tooth. Dental x-rays also help confirm that root canal therapy can be done on a tooth. Sequential x-rays also are taken at each step of the root canal process to help ensure success. To the left is a dental x-ray of a tooth in the middle of the root canal treatment process. A radiographs shows a jaw fracture. The x-ray helps plan fracture repair. (there are also multiple retained tooth roots.